It’s not all about the big-money buys and there are some players currently without a club who are capable of making an impact across Europe. What this chap lacks in star quality, he more than makes up for in experience. Sead Ramović, the 35-year old Bosnian, started his career at Stuttgarter Kickers in 1999 before moving on to play for a host of sides in the Bundesliga including VFL Wolfsburg, Borussia Monchengladbach and Kickers Offenbach. In his most recent outing as a professional goalkeeper, Ramović was playing his trade at Norwegian club Strømsgodset (incidentally, this is the same side that Martin Ødegaard currently plays for) before resigning unexpectedly in May. Did you know? In 227 professional appearances, Ramović has conceded 319 goals. Would suit: Seriously, who would sign this guy? Now, this is a stellar signing. The former Nigeria captain spent last season on loan at Norwich City from Turkish champions Fenerbahce, but played only eight times as the Canaries were relegated. Hugely experienced having spent seven years at Everton playing over 200 Premier League matches, he is available after cancelling his contract by mutual consent with Fener, partly due to the restrictive foreign player quotas in the Turkish Super Lig. At 34-years old, he’s not quite as sharp as he once was, but Yobo offers a wealth of experience both on the pitch and in the dressing room. When West Bromwich Albion snapped up Uruguayan defender Diego Lugano on a free transfer back in 2013, they knew they were signing a player whose best days were firmly behind him. The former Fenerbahce and Paris Saint-Germain centre-back was once considered one of South America’s best defenders. However, at 34-years old, age has got the better of him and his shocking lack of pace makes Per Mertesacker look like Usain Bolt. After just one season at the Hawthorns, the Baggies released him but Lugano has since been linked with Arsenal and, more recently, a sensational move to Spanish giants Barcelona. Did you know? Lugano has made over 90 appearances for the Uruguay national team, finding the net nine times. Titus Bramble is the sole Englishman in the Free Agents XI. The former Ipswich, Newcastle, Wigan and Sunderland defender is without a club and is currently working as the Under-11 coach at Ipswich Town. Although it seems increasingly likely that Bramble will soon retire from playing, could there be just one final spell somewhere in England? Would suit: Any League One or League Two side that desperately requires cover at the back and are capable of matching his wages. Some of you may well be scratching your heads at this one…I was too. Cristian Lobato, a product of Barcelona’s famous La Masia academy setup, is a Spanish left-sided winger. Although he was initially released in 2007, Lobato was re-signed by the Catalan club and assigned to the B-team in June 2011 following an impressive spell in Spain’s third division. He did actually play alongside Messi and co. during a preseason fixture on one occasion, but failed to secure a regular first team spot. He has since featured for Real Zaragoza and Osasuna in Spain’s La Liga, but is now available as a free agent. At 25-years old, at least Lobato has youth on his side. How on earth is this guy a free agent? At 33-years old, I’ll admit Mahamadou Diarra’s best days as a defensive midfielder are well in the past, but the former Real Madrid lynch-pin might still be able to show the young guns of today a thing or two. Most recently spotted playing for Fulham at the end of the 2013/2014 Premier League season, Diarra has since struggled with a recurring knee injury that has threatened to end his career. Would suit: To provide that bit of steel in the middle of the park, Hull City. Lassana Diarra, or simply “Lass” as he is often nicknamed, is very much a younger, fitter and stronger Mahamadou Diarra. Since making his professional debut in France’s Ligue 1 in 2003, “Lass” has played for Chelsea, Arsenal, Portsmouth, Real Madrid, Anzhi Makhachkala and Lokomotiv Moscow in what has been an incredibly successful career thus far. Upon his release from Lokomotiv last summer following a falling out with coach Leonid Kuckuk, The Daily Mirror reported that QPR boss Harry Redknapp was interested in signing the French international but a deal failed to materialise. Somebody, somewhere MUST sign Diarra. Papa Bouba Diop is arguably best remembered for scoring an absolute screamer for Fulham against Manchester United and winning the FA Cup with Portsmouth, but it’s fair to say he hasn’t done a lot else since. Spells with West Ham, AEK Athens and more recently Birmingham – where the club couldn’t afford to keep him – have seen the Senegalese war horse become a free agent. Would suit: He’s 36-years old, so let’s be realistic with this one. Kidderminster? Okay, so strictly speaking, Freddy Adu is an attacking midfielder and not exactly a right wing-back. But, he’s also a free agent, so he’ll play where he’s told. Adu, who made his professional debut aged 14, is again without a club having been released by Serbian side FK Jagodina. Once labelled as ‘the next Pele’ during the early stages of his career, the Ghanian-born forward has played just 59 minutes of competitive football since the end of the 2012 MLS season. Should he sign for a club in the near future, match fitness might just prove a stumbling block. When you Google Otman Bakkal, it would seem the only thing he is recognised as is being ‘the first player Luis Suarez bit’. From a potential manager’s perspective, that’s not exactly encouraging. Besides being bitten by Suarez in 2010, Bakkal has enjoyed a rather modest career; quietly going about his business in the Eredivisie, the Dutch top flight, and in Russia. What we can tell you though is he’s 29, plays as an attacking midfielder and is currently without a club (we’re assuming there’s a valid reason for this). Did you know? Bakkal very nearly joined the Barclays Premier League in June 2012, after attracting the attention of Swansea City. Shola Ameobi, who is now 33, was once a fan favourite on Tyneside having made over 300 appearances in the black and white stripes of Newcastle United. The Nigerian international was released by the Magpies in May 2014 before signing a one-year contract with Turkish second-tier club Gaziantep Büyükşehir Belediyesi. Ameobi departed the club, however, only five months into the deal citing family reasons as an issue. Did you know? Ameobi played in the Champions League and scored against Barcelona at the Nou Camp in December 2002. 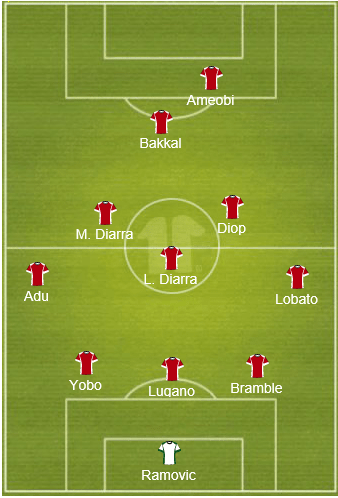 Would suit: Crystal Palace, who are in dire need of a strong, proven striker.